We’ve been seeing this shiny fabric all over the runways and streets for months..from trenches, skirts, boots, you name it! Some may think it’s a bit too dominatrixy or unrealistic for day-to-day life, but it’s really all about how you wear it! My favorite way to style patent is with booties and a feminine blouse so it balances out your look and gives you a more flirty vibe rather than grunge. I also like adding contrast by combining different textures in my outfit…anyone remember my Pink, Patent + Lace outfit from last NYFW?! Still one of my ultimate faves and can’t wait to bring out my patent pieces this fall! Just 2 days into Fall/Winter 2017 New York Fashion week, velvet was dominating the runways. So if you didn’t give into the velvet trend last fall, you may want to reconsider this season ;) This fall, velvet is back better than ever with rich, luxe, and bold colors like hot pink and mustard gold! At this point I’m ready to go for a head-to-toe velvet look, but for those of you who aren’t ready just yet, adding a touch of velvet to your outfit whether it’s a top or booties will elevate your look and make you feel more luxurious! There’s nothing better when one of the hottest trends of the season comes along with comfort and practicality. I love a good tracksuit, especially on days when I’m feeling lazy or want to throw on something quickly that can still look chic and put together! This season athleisure has a whole new meaning and it’s all about that cool-girl vibe and swagger that can take you from the couch to a day out without putting in much effort. From the runways to celebrities and streetstyle influencers, we’re seeing updated tracksuits that are shapely and fitted, color-blocking, and silver sneakers that will have you feeling cozy and chic all at the same damn time ;) And if you’re still iffy about wearing sportswear for a day out, wear one element of athleisure like a pair of sneakers or track pants mixed in with something more high end for a look thats effortless, yet chic. Fall isn’t about dark burgundy’s, camel tones, and black anymore..this season we’re having more fun! The Fall/Winter 2017 runways were all about embellished pieces, velvet, lace, plaid, sheer silhouettes, and LOTS of metallics! Power red is the official color of fall 2017 and it’s not just any red. Think firetruck red..show-stopping, vibrant, and eye-catching as ever! Red dominated the runways in all sorts of combinations, from sophisticated power suits, seperates, and red leather thigh high boots (my personal fave). Shirt Dress + Thigh High Boots | #30WeeksPregnant! These trends are everywhere right now and I am so glad they are! Such great ones especially the velvet and red trends! Love your choice of fall fashion trends! Thanks Magda! Hope to see you rockin these trends babe! 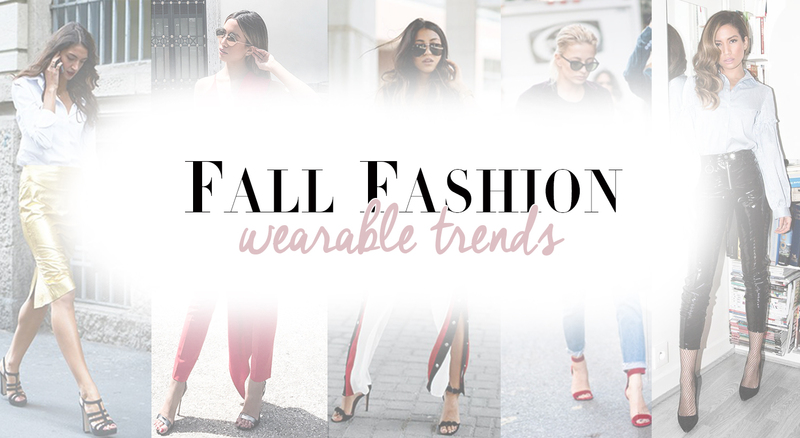 Such amazing trends for the Fall! Cannot start wearing all the plush velvet! Lovely pieces, Jessi! There are all gorgeous but give me velvet and red, any day! Love these trends for Fall!! Especially the velvet one! Glad its still in! Hope you have a great day Jessi! 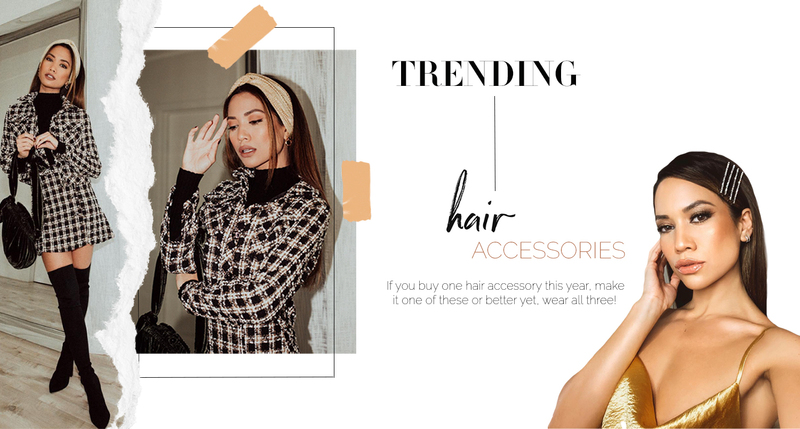 I’m loving all these trends and I can’t wait to style them all this season! I think they’re so practical and easy to incorporate into any wardrobe, regardless of style! Thanks for sharing, gorgeous, and I hope you have a great week ahead! Loving all the velvet and metallic looks!!! I have a few velvet pieces but I think I need to check out some of the metallics you posted. Love love love! Couldn’t agree more w/ this round up! I have to say I am super on board and can’t even pick a favorite!! Great trends.My absolute favorite is velvet.I really just love a great velvet piece. Ahh I wish red would suit me more.. love that trend! Great post, thanks for sharing :) I love these trends and the pieces you picked out! Glad you liked the post Camille, I’m really loving patent leather for fall!! I like the trend items! They are all pretty and fab! Aww thanks babe, hope you have a great week! Im digging Velvet too! especially the bags that are out right now… gorgeous! I’m into the velvet bandwagon right now! Nice roundup dear, really lovely read. Learned a lot today.